During the past 30-plus years, our nation’s pollinator populations have suffered serious losses due to invasive pests and diseases, such as mites and viral and fungal pathogens, exposure to pesticides and other chemicals, loss of habitat, loss of species and genetic diversity, and changing climate. Numerous species of butterflies, moths, and native bees are either extremely rare or are extinct. A recent report states that 44 percent of managed honey bee colonies were lost in 2015-2016, largely due to infectious diseases carried by varroa mite larvae. Recognizing the importance of honey bees and other pollinators to agriculture and the health of natural systems, President Barack Obama established the Pollinator Task Force to develop a national strategy to protect and promote health of pollinators. The task force, co-chaired by the U.S. Department of Agriculture and the U.S. Environmental Protection Agency, released the Pollinator Research Action Plan in May 2015. This comprehensive plan guides the federal agenda, including research, to restore and increase pollinator habitat and populations. The National Institute of Food and Agriculture (NIFA) is making major investments to protect and promote pollinator health and protect U.S. agriculture. Between 2008 and 2014, NIFA invested approximately $40 million in competitive and capacity grants devoted to research, extension, and educational programming on bee health. Just this past month of May, NIFA announced a new, stand-alone $6 million funding opportunity through the Agriculture and Food Research Initiative’s Food Security Challenge Area to address some of the priorities of the Pollinator Research Action Plan. In fiscal year 2017, NIFA plans to dedicate $10 million in funding for pollinator health research. The Bee Informed Partnership (BIP), an extension-led consortium of bee researchers and extension specialists, is working closely with beekeepers and queen breeders to demonstrate monitoring techniques for disease and mite management. The partnership is also working with queen breeders to use regionally appropriate practices for selecting mite and disease resistance traits. Recent findings show that beekeepers who follow BIP guidelines to manage varroa mites have a 20.4 percent annual colony loss rate, which is a remarkable improvement. Washington State University (WSU) researchers successfully recovered germplasm from a unique honey bee strain from Kazakhstan to enhance the high quality genetic traits in honey bee stock. The WSU Honey Bee Germplasm Repository will use cryopreservation (deep freeze) methods for long-term storage of bees to be used for breeding improved honey bee strains and for distribution to major honey bee queen producers in the United States. 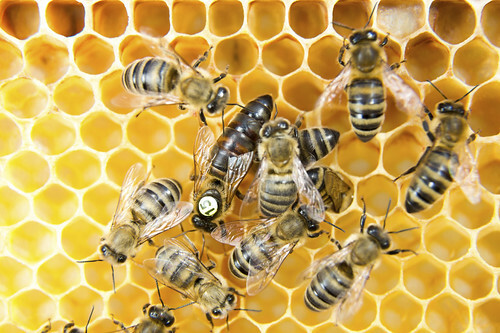 American foulbrood (AFB) is a prevalent and serious bacterial disease that affects honeybees. University of Nevada-Las Vegas researchers used NIFA funding to identify a virus that attacks AFB. Experimental trials to treat AFB infections have significantly reduced AFB levels and increased overall honey bee colony health. NIFA awarded $9 million to a team led by Michigan State University to study the performance economics and farmer perceptions of different pollination strategies. Most recently, investigators provided the first-ever quantitative assessment of the status and trends of wild bees the United States. Estimates showed that wild bees declined 23 percent across the United States between 2008 and 2013. The declines appear to be a result of conversion of natural habitats to row crops, such as corn and soybeans, in the Midwest. NIFA-funding helped develop and distribute Science, Technology, Engineering, and Math (STEM)-based K-8 lesson plans—“Local Heroes: Your Hardworking Pollinators”—to 3,000 formal and non-formal educators. More than 100 land-grant colleges and universities receive national program leadership and funding support from NIFA to create extension education programs for their communities. One example is the integrated pest management program at Lincoln University that helps farmers minimize pesticide use.